Garry Monk is expected to be in charge of Swansea City against Bournemouth in the Premier League on 21 November. However, the result of that game could have a significant impact on his future following reports that Monk is set to be sacked as manager. Swansea's 1-0 defeat at Norwich saw them drop to 14th - five points above the Premier League's relegation zone. A senior figure at Swansea City has told BBC Wales Sport of his "surprise" about the reports. "Yes, no question about it," said the Poland international. 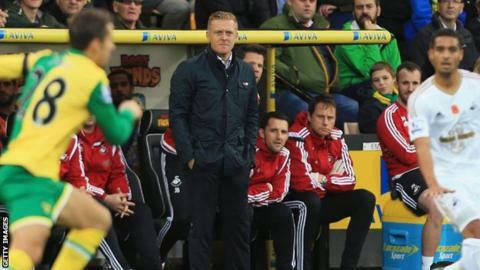 The defeat at Carrow Road on Saturday means Monk's side have won only once in the league since August. Understandably there is concern over a run of just one win in nine League and Cup matches, but sources at the Liberty Stadium suggest Monk is not facing imminent dismissal. He is expected to be given time to turn it around and it's anticipated he will remain at the helm when the Swans play their next Premier League game - at home to Bournemouth, on November 21. Swansea dominated possession against Norwich but were caught out in the 70th minute when Jonny Howson headed in from short range following a corner. Monk, 36, says the Swans have to fight their way out of their current poor run of form and Fabianski says the team have to "stick together". "At the moment it's not going well for us," Fabianski added. "We need to regroup and try and bounce back as quickly as we can. "We have to continue to work hard and we've got to stick together as a group. "Hopefully we will be able to bounce back quickly." Poland goalkeeper Fabianksi hopes the international break will be an opportunity for Swansea to regroup ahead of the home game with Bournemouth on 21 November. Bournemouth slipped into the bottom three after defeat at home to Newcastle United and Eddie Howe's side have gone six league games without a win. "Hopefully it will be a good break for us and we'll come back stronger," Fabianski said. "I'm hoping we can go on a good run and get some good results."